Fibromyalgia is a disorder that causes pain all over the body, sleep problems, fatigue, and often emotional and mental distress. Fibromyalgia amplifies painful sensations by affecting the way your brain processes pain signals, meaning people with fibromyalgia are more sensitive to pain than those without the disorder. 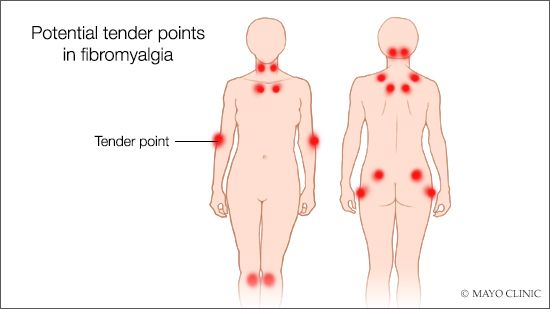 According to the Centers for Disease Control and Prevention, fibromyalgia affects around 4 million U.S. adults, or about 2 percent of the adult population. On the next Mayo Clinic Radio program, Dr. Christopher Aakre, an internal medicine specialist in Mayo Clinic's Fibromyalgia and Chronic Fatigue Clinic, will discuss diagnosing and managing fibromyalgia. Also on the program, Dr. Andrew Bentall, a Mayo Clinic nephrologist, will explain what can be done to help sensitized transplant patients who can be difficult to match with organ donors. And Dr. Victor Karpyak, a Mayo Clinic psychiatrist, will share research on how your genetics can affect your response to treatment for alcohol use disorder. This research is funded by the National Institute on Alcohol Abuse and Alcoholism.